Something that I loved about TechCrunch Disrupt last week is that the top two startups that launched in the competition weren’t from the U.S. – winner Soluto is based in Israel, and runner up UJAM is a German startup. In our previous events we had lots of non-U.S. startups, too, but the winners have always been U.S. based teams. So to have startups from Israel and Germany win was a real treat for me personally. The judges selected Soluto, which is software to make your computer run better, as the clear winner. The company has a proven team, lots of funding and has been working on the product for two years, they say. We take audience voting into account as well, and we will also put in our vote. But at the end of the tallying there just wasn’t much of a discussion. You can never tell how a startup will do until it actually launches (see, for example, Cuil, which had massive funding and a killer team but flopped on launch), but everything we saw suggests that Soluto is likely to go on to do amazing things. And they have a terrific business model. They deserved to win the Disrupt Cup. 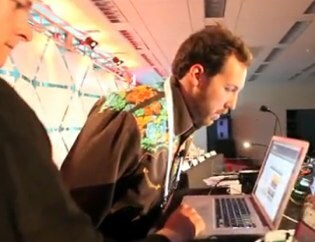 But a lot of people watching from the audience and the livestream thought UJAM, which lets anyone create music, was much more exciting, and potentially very disruptive to the music creation process. If you haven’t seen their demo yet, which had a number of spontaneous breakouts of applause and yelling, you should. I’ve embedded it above. At one point judge Chris Sacca even got up and tried it himself, and the audience loved it. The judges also liked UJAM and there was some discussion about them winning. But the product is just so early, not even in public beta. And they haven’t quite nailed down their business model yet. There are lots of ways for UJAM to still blow it, however unlikely that is. The whole Soluto v. UJAM situation reminds me of our TechCrunch50 event in 2008. Yammer, which gives businesses a private twitter-like service within the company, took the top prize. And a startup called Swype, with launched a new way to do text input on tiny mobile touchscreens, took a runner-up spot. Yammer, like Soluto, isn’t a company that is all that exciting to talk about. But both startups provide a much needed service, and Yammer is ramping up their business nicely with revenue doubling every quarter. They’re likely to have a really nice liquidity event. And like UJAM, Swype stole everyone’s hearts. People wanted to try Swype themselves, and you can see all the judges getting up from their seats after the demo to try it themselves. People were jumping up and down in the audience. Etc. Watch it all here. Swype also had amazing founders, and since TechCrunch50 has gone on to do amazing things. Their software is now being built into tens of millions of mobile handsets a year, and they collect a fee for every install. But at the time they just weren’t far enough along to win the show. Their first big licensing deals were ahead of them, and the judges felt more comfortable with Yammer as the winner. And like UJAM, a lot of audience members were really angry that Swype didn’t win it all. The real frustration some people have at TechCrunch Disrupt is that there are startups with two years of development and $10 million in funding competing head to head with startups with no funding and less development time. Some people have asked that we limit the amount of funding or put in other rules to level the playing field. We’re not going to do that. The real win for companies is to simply launch at the event in front of so many people. TechCrunch Disrupt had 1,700 attendees in person, and another 100,000 people watched on the livestream. There’s just no other place in the world that can give a startup so much mainstream attention so fast. The fact is that people are watching, and all the press is there, because of the way we hold the event. They want to see hot startups that are well funded and a little more full baked. Take those away and fewer people are interesting. There are separate discussions with popular technology leaders and investors, for example, which draw in the crowds and press. They stay to watch the startups launch. If we mess with that formula too much, or add too many more filters to the types of companies that can launch there, that careful balancing act could be thrown off whack. So we do other things to help really young startups get going. Like holding the hack day before the event which lets people get stage time for their projects and get into the event for free. There were 300 engineers at the event that almost certainly wouldn’t have been there otherwise because of the Hack Day. And some of those engineers are going to be launching their startups in future TechCrunch Disrupt events. Also, the awards are more of an audience pleaser than anything else. The audience seems to be uncomfortable if you don’t name someone the winner, even if, really, it’s just too early to be calling any of these companies winners and losers. So we ask the judges to do their best, and make a call. Sometimes the company that got everyone out of their seats doesn’t win. But in the end, they really do.